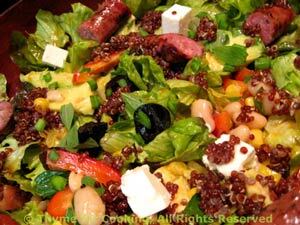 Southwestern Salad with Grilled Sausages, Healthy Weekly Menu Plan. There are a lot of flavors and vegetables packed into this salad.... Use any type of sausage you like: pork, chicken, turkey. The quinoa, corn, beans and peppers give this salad a 'southwestern' flavor. The oregano, Greek olives and feta a Mediterranean flavor. An eclectic Salad! It's equally good with turkey, chicken or sausages! Open, drain and rinse the sweet corn and white beans. Slice the avocado (see techniques). Cube or cut the feta. Cook the sausages on barbecue grill or sauté in nonstick skillet until done, 8 - 15 minutes, depending on size. Remove and cut into 1 1/2" (4cm) lengths.